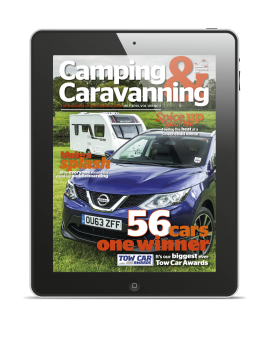 The iOS version of Camping & Caravanning magazine is available to download to your iPad – a medium that offers exceptional levels of audience engagement and brand enhancement. The cutting-edge tablet edition, launched in August 2014, translates the award-winning Camping & Caravanning content into a unique, interactive digital environment, capable of connecting your brand to our audience like never before. It features all the usual great content displayed in an easy-to-use and modern interface to ensure readers can enjoy reading the magazine more than ever, wherever they are travelling. Each page is specifically optimised to deliver responsive features and at-a-glance information, plus exclusive tablet-only enhancements. The intuitive features also mean it’s easy for readers to make the most of membership and to respond directly to your advertising while reading. For example, they can read about a particular Club Site, and book it directly using the active links, or engage directly with your products and purchase from your website. Tablet editions totally re-imagine the possibilities of a digital magazine, providing readers with an intuitive experience guaranteed to secure reader engagement and capable of enhancing your advertisement or sponsorship.